Take the guesswork out of your training program and improve your performance by working with a Life Time Cycle Coach! Combining the science of training with the art of coaching, Life Time Coaches are certified professionals focused on helping their athletes reach their athletic goals. Tiffany Berenberg has been in the health and fitness industry for over 20 years. For the past 9 years she has been building up the Life Time Cycle program in the northwest region of the Minneapolis Area. With her motto of getting as many as she can to the start line, she has gotten her athletes to join her at a variety of endurance sports; from triathlons and running races, to road cycling events and mountain bike races. 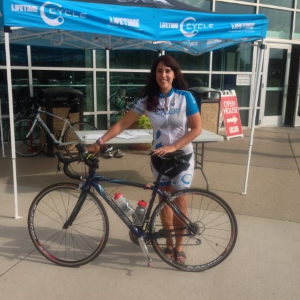 Being the Life Time Northwest Cycle Coordinator she helps cyclist master their cycling abilities and reach their goals. Cycling is her passion and as a Cycle Coach, she will help you with all your cycling domains: training, technical, tactical and equipment knowledge. With all her experience and coaching, Tiffany can get you to the start line and greet you at the finish line. Success. Coach Tiffany Berenberg has been notified of your message.